The Supreme Court announced on Monday it has struck down an Arizona law that required voters to provide documentary proof of citizenship before registering to vote. 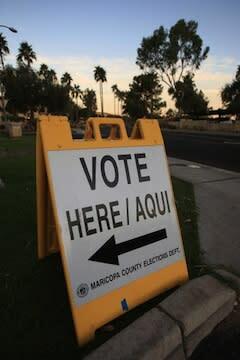 In Arizona v. Inter Tribal Council, seven justices agreed that the Arizona law oversteps the state's authority by essentially invalidating the federal voter registration form. The form, established by a 1993 law, lets people register to vote by sending in a uniform document accepted by all states. Voters must swear they are citizens on the form. In a 2004 ballot initiative, Arizona voters decided they wanted to go beyond that federal requirement, by asking for proof of citizenship—such as a birth certificate, passport or tribal ID card—at the point of voter registration. Critics of the Arizona law argued that it stripped some voters of their ability to vote, because some civil rights groups estimate that about 13 million citizens do not have documentary proof of their citizenship. The law's supporters said it would guard against any attempts by noncitizens to vote in federal elections. Three other states had similar laws and joined in on the case. The opinion striking down the Arizona law was written by Justice Antonin Scalia, one of the court's conservatives. Justices Samuel Alito and Clarence Thomas, also members of the court's conservative wing, disagreed with the ruling. A year ago, the Supreme Court struck down several parts of Arizona's SB1070 law, which sought to give the state broader enforcement powers against unauthorized immigrants. The court in that ruling argued that the federal government's immigration laws preempted the state's, and that Arizona was interfering with federal power. The court did let a key aspect of the law stand, however, giving local and state police the power to inquire into immigration status during routine stops. The court has yet to release its decision in Shelby County v. Holder, a case that will decide whether states with a history of voter discrimination must continue to get federal approval to change voting-related laws. The decision could have a big effect on whether laws that require voters to show identification at polls in these states will pass legal muster. "Today's case ... reiterates that when it comes to federal elections, Congress has quite a bit of authority," Jon Greenbaum, chief counsel for the Lawyers' Committee for Civil Rights Under Law.